This is a tetralogy- four related novels. The four were published between 1924 and 1928. The first novel, originally published as "Some Do Not' is set in England prior to and in the early days of the The Great War. We are introduced to the central character, Chrstopher Tietjens, his rather horrible wife, Sylvia,(whom Graham Greene described as the most horrible woman in literature), a lover and other family members. The second and third books," No More Parades "and "A Man Could Stand Up" are set in France in the trenches. The fourth book "The Last Post" is set set back in England after the war with Tietjens playing a very small part. 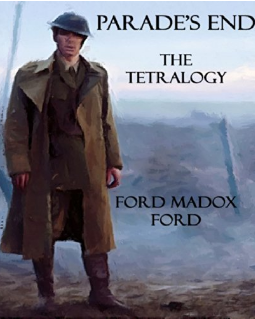 Ford served in The Great War and has written one of the greatest anti-war novels I've read, its better than "All Quiet on the Western" which moved me greatly and up there with Catch 22. But for a war novel there is very little fighting. All four books are told in a 'stream of consciousness style by the characters. Tietjens is unrelentingly moral and will not lower his standards for anyone. He won't divorce his wife who has had a string of affairs and who became pregnant with another mans child. He is a constant- loyalty and behaving honourably are the standards by which he lives, even if it means living in poverty. In the trenches he makes decisions that he believes are best for his men; sometimes this back fires. He refuses leave for a soldier to go home because his wife his having an affair with a boxer. Tietjens believes if the man goes home the lover will kill him so he declines the leave. Shortly after a bomb lands on the soldier and kills him. Joseph Heller couldn't have done that! This is much too much of a book for me to adequately describe, but what I took from it was how the dolts that where the civilian and military decision makers during the war marched millions to unnecessary death. And for those in our nice safe society that state ANZAC Day and Memorial Day commerations and the like glorify war rather than glorify the sacrifices of those that died are fools and don't really deserve our nice safe society. Reading this was an wonderful experience. Anthony Burgess says this is the greatest novel of the 20th century and he knew what he was talking about.